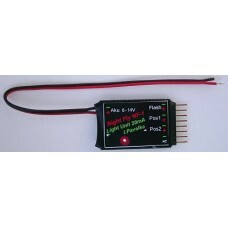 "Low End" medium size controller for wingspan from 0,5m to 1,0m, outputs for 20mA LEDs: 2xPermanent / 1xFlashing. Power 4,5V-14V. NF-1 is a unit designed for illumination of tailless models, and SlowFly and ParkFly models for flying at night. They are used to power colour ultra bright LEDs (Light-Emitting Diode) with nominal current of 20mA. It contains three independent current-powered outputs for connection of diodes. Two outputs are on permanently and are designed for position lights (Pos1, Pos2). The third one (Flash) is flashing with one-second frequency and is designed to power the anti-collision flash lights. The circuits maintain the nominal current in the wide range of voltage from 6 to 14V without the need to connect compensating series resistance in the circuit. The stabilization starts working from 5.0 V so it is possible to connect the unit with the used NiCd or NiMH batteries with 4 -10 cells. As the number of the cells of the powering accumulator increases, so does the number of diodes that can be connected (serially) in one circuit. Using seven-cell-accumulator, two green or white diodes (voltage about 3.2V) or three red or yellow diodes (voltage about 2V). The colours of diodes in one circuit can be combined. A short-term short circuit does not harm the circuits thanks to the current outlets. The circuits are powered from the positive pole of the accumulator and the negative pole is joint by all circuits. The unit input is diode-protected against reversing of polarity.